What is Flevox spot-on and who is it for? FLEVOX® SPOT-ON SOLUTION contains fipronil to treat flea and biting/chewing lice infestations in dogs, and kill ticks. The product can be used as part of a treatment strategy for flea allergy dermatitis (FAD) where this has previously been diagnosed by a veterinary surgeon. FLEVOX® is an easy to use topical solution that comes in unique single pipette packs to make it easy to buy the required amount. As an added bonus, for each pipette you buy, Vetoquinol will donate 5 pence to Dogs for the Disabled. What is the active ingredient in Flevox spot-on? The active ingredient in FLEVOX® is Fipronil, an insecticide and acaricide. Fipronil works by causing uncontrolled activity of the central nervous system (CNS), and death of fleas, biting lice, and ticks. Insecticidal efficacy against new infestations with adult fleas (Ctenocephalides spp) persists for up to 8 weeks. Newly arriving fleas are killed within 48 hours of landing on the animal. The product has a persistent acaricidal efficacy for up to 4 weeks against Rhipicephalus sanguineus and Dermacentor reticulatus ticks and up to 3 weeks against Ixodes Ricinus. If ticks of these species are present when the product is applied, all the ticks may not be killed within the first 48 hours, but they may be killed within a week. After a local application of fipronil to the dog, it is slightly absorbed through the skin. Low levels of fipronil may be detected in the plasma, with a very high variability between dogs. After application, there is a good distribution of the product in the hair, from the application zone peripherally. The concentrations of fipronil on the hair decrease with time. Box containing one 4.02 ml pipette in an individual blister. What is in Flevox spot-on? How do I use Flevox spot-on? Application is only by topical application to the skin. 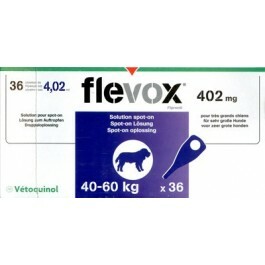 Apply 1 pipette of 4.02 ml FLEVOX® SPOT-ON topically per dog weighing over 40kg and up to 60kg bodyweight. 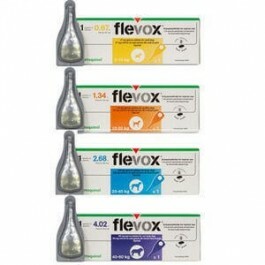 For dogs over 60kg use two pipettes of 2.68ml (FLEVOX® for large dogs). The product's insecticidal efficacy against new infestation with fleas (Ctenocephalides felis) persists for up to 8 weeks. The product has not demonstrated an immediate acaricidal effect against ticks but has demonstrated persistent acaricidal efficacy for up to 4 weeks againstRhipicephalus sanguineus and Dermacentor reticulatus and up to 3 weeks against Ixodes Ricinus.If ticks of these species are present when the product is applied, all the ticks may not be killed within the first 48 hours but they may be killed within a week. When used as part of a strategy for the treatment of Flea Allergy Dermatitis, monthly applications to the allergic patient and to other cats and dogs in the household are recommended. Part the coat between the shoulder blades until the skin is visible. Place the tip of the pipette on the skin and squeeze gently to empty its content onto the skin. It is important to make sure that the product is applied to an area where the animal cannot lick it off (e.g. near the base of the head), and to make sure that animals do not lick each other following treatment. Care should be taken to avoid excessive wetting of the hair with the product since this will cause a sticky appearance of hairs at the treatment spot. However, should this occur, it will generally disappear within 24 hours post application but can persist for up to 2 weeks. In the absence of available data, the product should not be used on puppies less than 8 weeks old and/or weighing less than 2 kg. This product has been developed specifically for dogs. Do not use on cats as this could lead to overdosing. It is important to make sure that the product is applied to an area where the animal cannot lick it off. Do not allow recently treated animals to lick each other. Avoid contact with the animal's eyes. Should the veterinary medicinal product come into contact with the eyes, rinse thoroughly at once with water. Do not apply the veterinary medicinal product to wounds or skin lesions. Ticks already on the animal prior to treatment may not be killed within the first 48 hours after application of the product, but they may be killed within a week. Removal of ticks already on the animal at the time of application is recommended. The product does not prevent ticks from attaching to the animal. If the animal has been treated prior to exposure to the ticks, most ticks will be killed within 48 hours of infestation. This will usually be prior to engorgement, minimising but not excluding the risk of transmission of diseases. Once dead, ticks will often drop off the animal, but any remaining ticks may be removed with a gentle pull. Use in pregnancy and lactation only after a relevant benefit-risk analysis made by the responsible veterinarian. No data on the effect of bathing/shampooing on the efficacy of the product are available. Therefore, bathing or immersion in water within 2 days of application and more frequent bathing than once a week should be avoided. This veterinary medicinal product can cause mucous and eye irritation. Therefore avoid contact of the product with mouth and eyes. Should the veterinary medicinal product come into contact with the eyes, rinse thoroughly at once with water. If the eye irritation persists, seek medical help at once and show the package insert or label. Avoid contact with the skin. Should the product come into contact with the skin, wash with soap and water. Wash hands after use. Animals or operators with known hypersensitivity to fipronil or one of its components should avoid contact with the veterinary medicinal product. Treated animals should not be handled until the application site is dry, and children should not be allowed to play with treated animals until the application site is dry. It is therefore recommended that animals are not treated during the day but during the early evening. Moreover recently treated animals should not be allowed to sleep with owners, especially children. The product should not enter water courses as this may be dangerous for fish or other aquatic organisms. Do not contaminate ponds, waterways or ditches with the product or empty container. Dogs should not be allowed to swim in watercourses for 2 days after application. Is there any further advise I should know about Flevox spot-on? Fleas from pets often infest animal's baskets, bedding and regular resting areas such as carpets and soft furnishings which should be treated, in case of massive infestation and at the beginning of the control measures, with a suitable insecticide and vacuumed regularly. For more information on Flevox and flea and tick control,click here.